Today I facilitated a workshop on Social Software. While the comments were all positive and I sensed excitement about the tools and new considerations for learning, I know I talked too much. 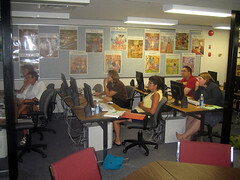 I began the workshop with an introduction to Web 2.0 and the changing classroom. I wanted to set the stage for day and provide context to all the tools we’d look at. I know Alan recommends “showing the demo” but I’ve too many times shown someone how to blog without talking about why to blog. As a result, I spent easily as much time today dealing with pedagogy as I did with hands on experiences. That bothered me. One comment was that it could have been a three day workshop. That would be ideal, but three days is a lot to ask for teachers when they are volunteering to give up a warm summer day in Saskatchewan. So as usual, I tried to cram in as much stuff as I could. Should I have done one day on blogging? Perhaps. Yet many commented that the most useful parts of the day was the time spent on RSS and Bloglines and others got very excited about the possiblities of services like Flickr. As I walked through portions of my wiki, I would constantly revert to stories regarding pedagogy and things I’ve either witnessed personally or read about via blogs. I designed the wiki so that participants would be able to go back and revisit all the “how to” parts and work through them on their own. What I fear they won’t have is the context. The context that I’ve been experiencing in depth for the past 18 months. Today Wes emailed me and thanked me for guest blogging. He also gave me some insights about things to keep in mind during my upcoming trip to Yellowstone. He didn’t go into great detail but provided me with some helpful tips. Is this the same way I should have facilitated things today? Maybe but the difference is while I’ve never been to Yellowstone, I’ve had some experience travelling. I can figure out many things on my own. But what if I’ve never gone on vacation? What if I’ve never crossed a border or booked a accomodation? In that case, his advice would be less helpful because I’d have bigger concerns. That’s where I think many of our teachers are at. They are so new to everything that the Read/Write web can do that they need more context. They need to understand clearly why and how they should be using the tools.